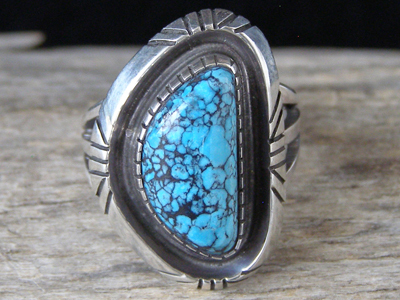 Melvin Francis is a Navajo silversmith who lives in the Gallup, New Mexico area. We first offered his work on our website in 2003, at which time he was beginning his smithing career. He has matured as a silversmith since then and mastered many different styles and techniques in silversmithing. This ring is set with a crescent-shaped stone of natural Chinese turquoise set in a notched bezel. The stone is slightly recessed in a shadowbox formed by the beveled edge which defines the edge of the ring face. Hallmarked FRANCIS and stamped Sterling inside the shank. Ring face: 1 1/8" x 3/4"